Published by Enough is Enough. Written by Riot Turtle. Images by Haute Durance en Resistance Facebook page. Support Riot Turtle’s Independent Journalism and his work for Enough is Enough! On December 22 the Enough is Enough collective will open an Info-Café in Wuppertal (German territory). It will be the offline section of the Enough is Enough collective. I will also work in the Info-Café and want to ask you to support this project with a small donation. We still have a financial gap and need your support. Please donate: 1€ already makes a difference. Last year fascists of the Generation Identity movement were bringing people in danger on the Mediterranean sea, with their “Defend Europe” campaign. The campaign ended in a disaster for the fascisists, but that didn’t stop them from other actions at European borders. In April fascists set-up a blockade on the Italian/French border in the Alps, again bringing peoples lives in danger. judge repeatedly denied any discussion of ‘societal’/ ‘political’ issues during the trial, although the accused took part in a political protest and therefore it was a political trial. The “Tous Migrants” migrants march in April. Earlier this week the court announced the verdict: Benoit Ducos, Théo Buckmaster, Bastien Stauffer, Lisa Malapert and Eléonora Laterza were given a six month suspended sentence for what the judge calls “aiding the illegal entry of a foreigner into France”. Mathieu Burellier, who was also prosecuted for rebellion, was sentenced to 12 months in prison, eight of which were suspended and put to the test for two years with the obligation to compensate the victims and to work. Jean-Luc Jalmain, also convicted for his participation in a gathering, is sentenced to 12 months in prison including eight suspended. The 7 activists will appeal the court verdict. 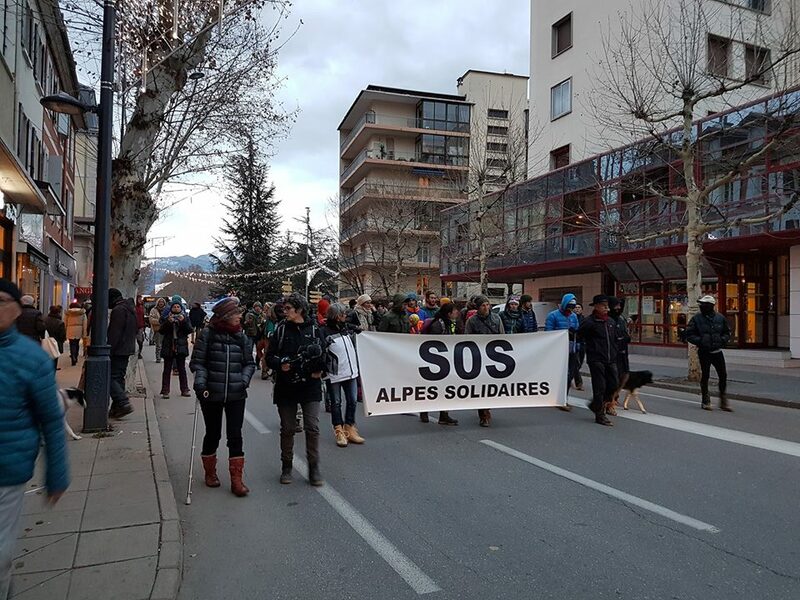 During the trial there were a lot of solidarity actions to support the Briançon7, which not only focussed on therepression against the 7 activists but also on the EU border regime. New hoodies, t-shirts and other stuff in the Enough is Enough shop. Support our independent reporting an our work in the Enough is Enough Info-Café. Click here.